For decades, projective techniques have been widely used within qualitative research studies as a means of unearthing some of the underlying thoughts, needs, attitudes and emotions that research participants often have difficulty articulating. Traditionally, such methods have only been available for in-person studies, and have in many cases been logistically difficult to pull off. However, the relatively recent emergence of online platforms (like our own BlogNog platform) for conducting qualitative research – along with increased wired, wireless, and mobile broadband connectivity and (thanks to social media’s ubiquitous adoption) the comfort that most people have with sharing their lives’ most intimate details online – has created a fantastic new arena for administering projective exercises via online methods. What we at Accelerant Research have found is that several classic projective exercises translate wonderfully into online methods. What can we say? There’s a reason why these techniques have stood the test of time, and online qualitative platforms present yet another avenue for leveraging the insights that these techniques provide, oftentimes in an easier-to-execute fashion than their offline predecessors. Participants love these types of exercises, because they are given an opportunity to be creative and have some fun with their responses, and marketers love them, because of the emotional connections and clues into appropriate product/brand positioning that they can offer. The following paragraphs outline some favorite online projectives that we have used in recent years and that have been well received by our own end-user clients. This is by no means an exhaustive list, but it does describe a few of the exercises that we have found to be the most impactful. Depending on the nature of your study, asking respondents to write a eulogy or birth announcement for a brand, product, or campaign can provide an insightful window into the customer’s connection with the subject of your research study. These are simple, familiar concepts to respondents, and they can easily wrap their minds around imagining that the brand you are studying has either passed away or is a newborn. “We are gathered here today to say farewell to a great company. A company that has put a lot of dealers on the map. A company that has altered the way some of us do business and win business. A company that has been a cornerstone in allowing our company to grow and one that will be sorely missed. What can I say about [CLIENT REMOVED] other than thank you. Thank you for the good times. Thank you for making our company a better one by allowing us to offer tremendous products at competitive prices, with margins that are incomparable to the competition. What will we do, where will we buy, how will we survive without this amazing group? Well, that remains to be seen. What I can say is that no one will forget how they came in and became the supplier for our company. We will be hard pressed to find another company that we can be as loyal to, but they would want us to continue to strive and grow our company even if they aren’t with us to help us get there. They would want us to move on, so we shall. The Birth Announcement is a cousin of the eulogy exercise that is often more appropriate for innovation research or new product development. In this technique, it can be insightful to not only ask participants to “introduce” a new product, concept, or campaign to the world, but also to instruct them to take it a step further and describe its life story as they envision it unfolding. Here is an example quote from a recent study conducted for a big box retailer who was testing a new loyalty program. [PRODUCT REMOVED] is named for the valued customers of [CLIENT REMOVED] stores, whom it is designed so serve. [PRODUCT REMOVED] indicates that it shall belong to the customer to serve and enhance their shopping experience. [PRODUCT REMOVED] begins life with a swipe at the cash register enabling it to record the purchase. Its potential becomes unfettered when the cardholder registers at the [CLIENT REMOVED] website where its boundless attributes are revealed. When your objectives are to understand the competitive landscape in a given industry or to literally reveal the “white space” that exists among target customers, then perception mapping can be a very useful exercise to give participants. In essence, the moderator creates a map comprised of two axes, each axis representing a specific attribute of the product/brand/category you are studying (e.g., price vs. quality). 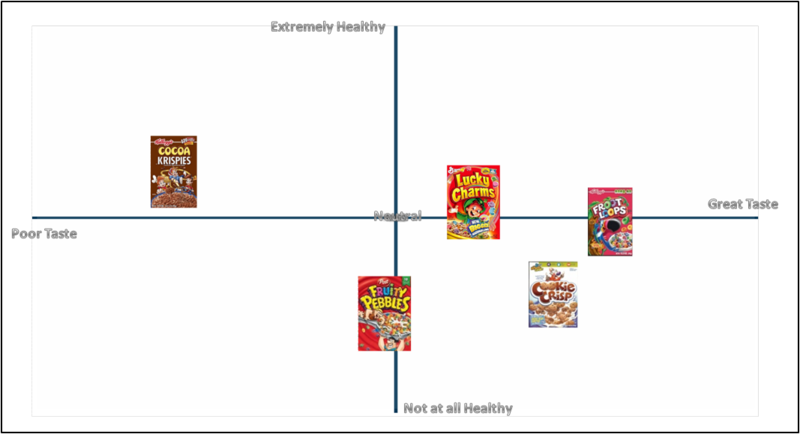 The poles of each axis are labeled at the extremes, creating a quadrant where participants are asked to place a certain number of brands, products, slogans, etc. Including these types of exercises in traditional face-to-face qualitative studies, while very useful, can be a bit clunky to pull off from a logistical standpoint (View article on Perception Mapping in F2F and Online Qualitative Research). Using white boards, paper-and-pencil, or easel pads can be messy at times, and compiling the results can be a nightmare. However, administering perception mapping online via drag-and-drop exercises is quite easy to set up, engaging for participants (tapping into the hot topic of research gamification), and allows researchers and clients to instantly view aggregate results. Asking participants to describe a product, brand, or campaign as a person or a seemingly unrelated object can be a very effective glimpse into what they really think/feel about the subject you are studying. The great thing about using online methods for collecting this information is that you can require participants to not only use text to describe what/who best represents the brand you are studying, but you can also allow your participants to upload accompanying photos to further drive home their points. There are lots of different variants of these exercises. A couple of our favorites are asking participants to describe which celebrity is most like a certain brand, or if your brand were an automobile, what make/model/style would it be. “[BRAND 1 REMOVED] is a male, a little rugged looking but good looking, well dressed in casual clothes. He is smart and well organized and fun. He is up on the latest trends and technology. He is a leader. He is a big outdoorsman, likes to work with his hands. [BRAND 2 REMOVED] is very similar to [BRAND 1 REMOVED]. Again he is male, good looking and dressed well but not quite as sharp as [BRAND 1 REMOVED]. He tends to be a follower rather than a leader. Still fun to hang out with. Still loves the outdoors and working with his hands. He is fairly smart but is a little more disorganized. Another recent favorite was a concept test we conducted for a new line of beauty care products. Participants were asked to describe the test brand, along with a couple of competitive brands, as celebrities and to upload photos of each. What emerged in the analysis was a clear perception of the test brand as being associated with glamorous “A-Listers,” while the competitive brand was more often associated with lesser-known stars. The collages of brand:celebrity associations we were able to create based on respondent-provided photos in another recent study were fantastic and were the most popular slides when the client presented the PowerPoint report internally to marketing and ad agency team members. TATs, or picture interpretation exercises, date all the way back to the early 1900s, but different variants are still widely used today in qualitative marketing research studies. The ease with which multimedia stimuli can now be shared online makes web-based qualitative research platforms excellent places to include these types of techniques. In some cases, participants are shown single pictures or a series of pictures and asked to tell a story relating to the research topic at hand. Other times, participants are asked to choose among an array of photos to tell their story, or participants might be asked to find and upload an image themselves that best represents the feelings and emotions that are conjured up by a certain brand. Below is a great quote provided in one of our recent HR research studies. Participants were asked to surf the web and find photos that represented their current job. Those are just a few of the projective exercises that we have had great success with migrating to online qualitative studies, but there are many others – both variations of those above and others that have not even been mentioned. What the best online techniques seem to have in common is that they are grounded in traditional methods. Online technologies simply allow us to further improve upon these classic techniques. Ideas First Lists The Ten Top Tips for Winning Ideas.